Racine Journal Times, Nov. 20, 1933. 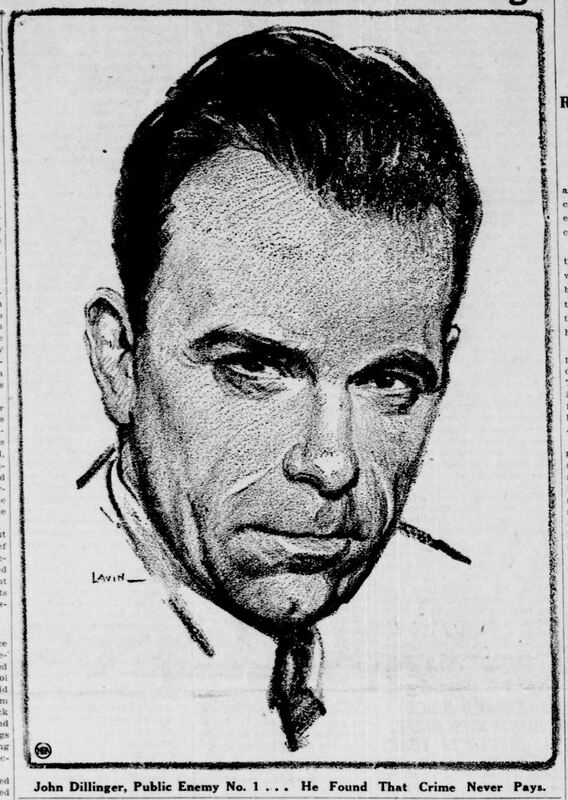 The notorious John Dillinger and his gang robbed the bank. Grover C. Weyland, kidnaped president of the American Bank & Trust Co., and Mrs. Ursula Patzke, a bank employee, who were taken on a wild ride by four bandits as the gunmen fled after a holdup at the bank at 2:30 oclock this afternoon were released at Waukesha at 5 oclock when the bandit car reached that place. Mr. Weyland immediately phoned his wife to allay her fears and told her that he and the young woman were being driven to their home in a police car. Grave fears had been felt for the safety of the pair when no word came of their release and there was general rejoicing when news of their safety was received. 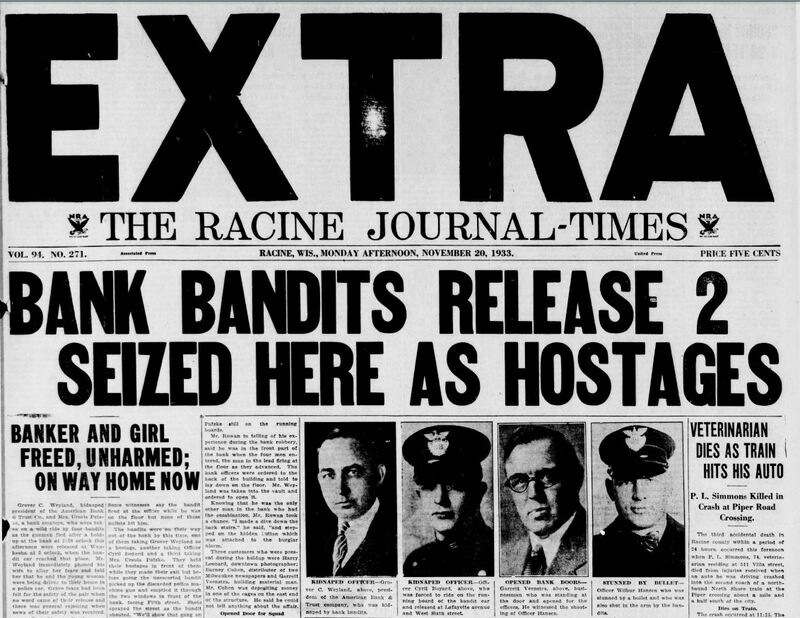 It was just 2:30 oclock this afternoon when four bandits armed with sub-machine guns entered the American Bank & Trust company building, the foremost bandit, a short chunky fellow firing a round of shots at the floor. These bullets struck the terraza floor and ricocheted in all directions, one striking Harold Graham, a teller in the right arm. Following the blast of machine gun bullets, one of the bandits remained at the front of the building where Grover Weyland, the president; L.S. Bowne, cashier, and L. C. Rowan, assistant cashier, were seated at their tasks. A second bandit went to the cage in the central portion of the bank and a third went to the cages at the east end of the structure. The leader then ordered all the bank officials, clerks and five customers to go to the back of the bank and lay down upon the floor. All hurried to obey while the bandits forced Messrs. Weyland and Bowne into the vault where a large safe, equipped with a dual combination held most of the banks deposits. Mr. Weyland was ordered to open the vault. He told the bandits he could not do so as he only had half the combination. They started to look for the officer who knew the other part of the combination. L. C. Rowan, the assistant cashier, who had this part of the combination, instead of laying down on the floor with others, dashed down a basement stairs and as he did so stepped hard upon an alarm button. This button sounded the bank alarm at the police station. The bandits did not know the alarm had been sounded and that police officers were already on the way to the bank, but proceeded to go into the cages, scooping up all the money in sight. Shortly after 2:30 oclock, Sergt. 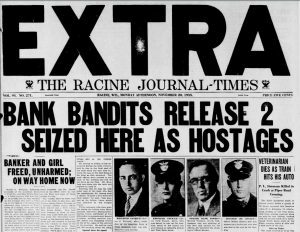 Wilbur Hansen and officer Cyril Boyard entered the front door of the bank, Sergt Hansen in the lead and carrying a sub-machine gun. “Let the cop with the gun have it,” shouted one of the bandits, serving as a lookout. The bandit at the front end of the building turned his machine gun at Hansen and fired several shots. Hansen fell to the floor, his forehead having been grazed by one bullet while another grazed his left arm. Some witnesses say the bandit fired at the officer while he was on the floor but none of these bullets hit him. Sergts. Hansen and Worsley were at the police station when the first alarm came in from the bank. Hansen, who is accustomed to leading bank details grabbed one of the two machine guns on hand while Worsley strapped on his revolver. Just then Officer Boyard arrived at the station in a police squad car so the three officers hurried to the bank in this machine. As they were entering the bank, Garret Veenstra, who was just going in, held the door open for them. “You fellows made plenty of noise as you were coming up the street,” said he. Then Veenstra looked into the bank and saw the bandits behind the cages and going over available funds. It was just at this point that one of the bandits started firing at Sergt. Hansen. He is apparently the only one of the bandits that attempted to shoot and as soon as he fell they left the bank with their hostages. Officers Wally Nelson and Lawrence Keys, both off duty, were going into the bank just as the bandits rushed out. The bandits shoved their machine guns into the officers ribs with a terse order to “Beat it.” The officers were shoved out into the crowd outside the place before they realized that a stickup had been staged. Some one as yet unidentified rushed out of the bank on the trail of the robbers and told Sergt. Worsley to go back to the station for more men and guns. This he did, returning in a few minutes with a load of police officers who surrounded the place. Chief Lutter was at the head of this detail, all the officers being armed with sawed off shot guns or carbines. The bandits in the meantime had leaped into their car which had been parked in back of the bank building in Fifth street. The bandits got into the machine and forced their hostages to stand on the running board. They headed south in Lake avenue to Eighth street and it is believed that they went west in Eighth street to Mead street where they turned north to Sixth street. At Sixth and Lafayette avenue they forced Officer Boyard from the running board and continued on their way with President Weyland and Mrs. Patzke still on the running boards. Mr. Rowan in telling of his experience during the bank robbery, said he was in the front part of the bank when the four men entered, the man in the lead firing at the floor as they advanced. The bank officers were ordered to the back of the building and told to lay down on the floor. Mr. Weyland was taken into the vault and ordered to open it. Knowing that he was the only other man in the bank who had the combination, Mr. Rowan took a chance. “I made a dive down the back stairs,” he said, “and stepped on the hidden button which was attached to the burglar alarm. Three customers who were present during the holdup were Harry Leonard, downtown photographer; Barney Cohen, distributor of two Milwaukee newspapers and Garrett Veenstra, building material man. Mr. Cohen was depositing money in one of the cages on the east end of the structure. He said he could not tell anything about the affair. Above are shown the leader and other members of the gang which staged the raid on the American Bank & Trust company at 2:30 p. m. Monday. At the extreme left is John Dillinger, gang leader, who escaped a trap set for him by Chicago police recently. He was the man at the wheel of the car parked in the rear of the bank, and it was he who stood on the walk at that point, firing bullets into the Mezinis photo gallery and at Detectives Bergerson and McEachern, who had worked their way through the hat shop opposite the bank. The second from the left is Charles Makley, who did all the shooting with the machine gun inside the bank, wounding Officer Hansen and Harold Graham, assistant cashier. The third from the left is Harry Pierpont, who went back of the railing near the front portion of the bank and calmly hung two Red Cross posters in the Main street window so as to shut off the view into the bank from the street. Warrants were taken out yesterday afternoon for all of those men, they having been identified as participants. The warrants charge robbery while armed and were issued by Court Commissioner Haley at the request of Oscar Edwards, assistant district attorney. The fourth and fifth men from the left are Russell Clark and Joe Burns. They are escaped convicts, but have not been positively identified as participants in the local bank raid. They are declared to be members of the gang, however, and are being sought. Warrants have not been issued for their arrest in the local bank case. 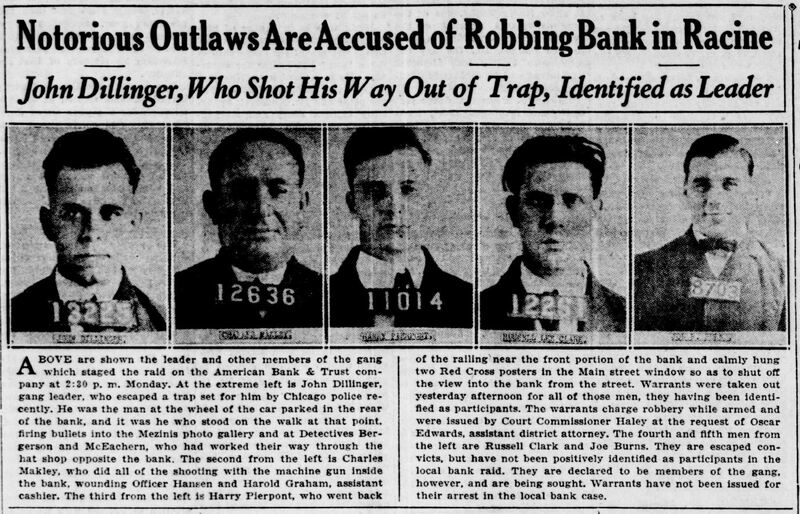 Death of Dillinger accounts for the last of five gangsters charged with taking part in one of the boldest bank robberies in the history of the state — the holdup of the American Bank & Trust Co., Nov. 20, 1933. The bandits obtained $27,000 in cash and a large amount in bonds in the Racine bank robbery. Police Sergeant Wilbur Hansen and Harold Graham, a bank teller, were shot. Grover Weyland, president of the bank, Mrs. Ursula Patzke, bookkeeper, and Officer Cyril Boyard were kidnaped. Boyard was dropped from the bandit car on the outskirts of Racine. Weyland and Mrs. Patske were tied to a tree in Waukesha county but managed to free themselves and walk to a farmhouse. The spectacular nature of the holdup was heightened by the fact that a crowd of several hundred persons gathered outside the bank while the robbers still were inside. 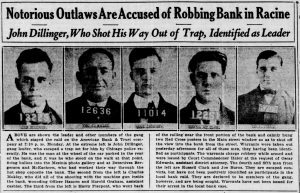 Dillinger and his companions spattered the sidewalk with machine gun slugs in fighting their way from the bank door to their car.